In the municipality of Monteverdi Marittimo, immersed in the green of the Pisan countryside, only 30 km away from the sea and on the edge of the small village of Canneto, is this lovely holiday apartment with private outdoor space adjacent to the pool. The swimming pool is shared with 6 other apartments, one of which is ITP605, ideal for those traveling with relatives or friends and who want their own space and privacy. The apartment is arranged on a single floor which is accessed by an external flight of stairs. 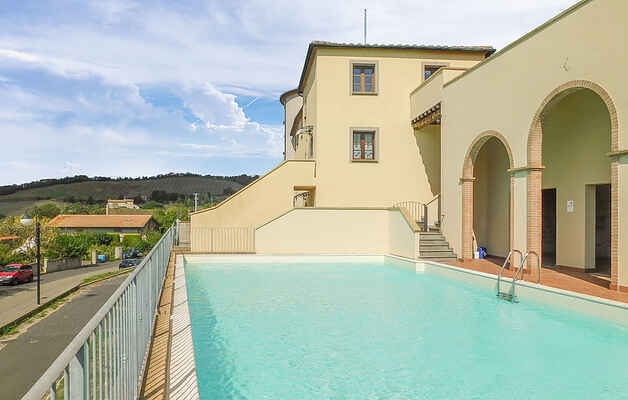 The location allows you to reach the sea in a short time, as well as famous tourist resorts such as Volterra or, a little further away, San Gimignano. The surroundings are rich in ancient villages that still retain their charm. Distances: Cecina 34 km, Follonica 40 km, San Vincenzo 46 km, the Gulf of Baratti 40 km, Volterra 40 km, San Gimignano 70 km, Siena 90 km, Montecatini Val di Cecina 32 km, Suvereto 21 km, Sassa 15 km. The accommodation is ideal for relaxing by the pool or as a base for exploring the beautiful surroundings.